Considerable cloudiness with occasional rain showers. Thunder possible. High 53F. Winds WNW at 10 to 20 mph. Chance of rain 40%..
A few clouds. Low 37F. Winds SW at 10 to 15 mph. Grizzly bears are currently listed as threatened under the Endangered Species Act. A grizzly bear sow and three cubs roam inside Yellowstone National Park. In this May 4, 2009, photo, a grizzly bear walks across a road near Mammoth, Wyo., in Yellowstone Park. A wolf from the Leopold pack trails a grizzly bear in Yellowstone in April 2005. 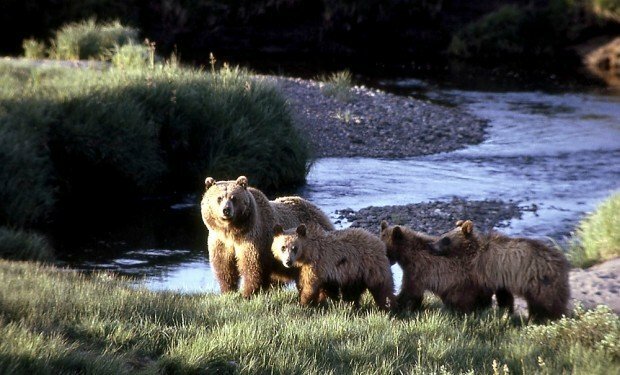 As grizzly bear populations in Yellowstone National Park have grown, supervisors of the six national forests surrounding the park in Montana, Wyoming and Idaho have had to be more vigilant about precautions at campgrounds. But in 2010, the mauling death of a Michigan man at a Montana campground just outside Yellowstone’s northeast boundary prompted forest officials to agree to undertake a collective review of their protocols. 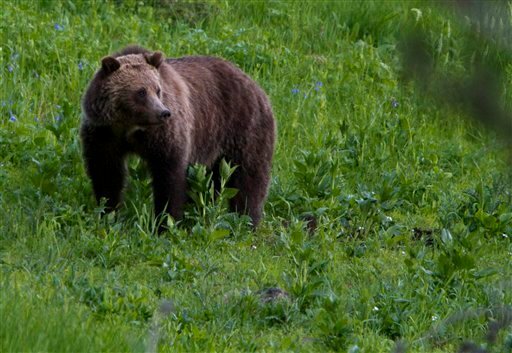 “The goal was initially to look at the causal factors that would put a campground at greater risk for grizzly bear incidents,” said Marna Daley, Gallatin National Forest public affairs officer. Those concerns seemed more valid after two hikers in Yellowstone were killed by grizzly bears in the summer of 2011. At a meeting next month, the supervisors will receive the information that Forest Service grizzly bear coordinator Dan Tyres has gathered over the past two years after visiting 166 developed campgrounds around the park. In addition to providing a practical inventory of what is in each campground — everything from the number of sites to how many food storage boxes may be present — the information will include bear distribution in the forests based on 21 years of data. Tyres also studied the reams of literature already written on bear encounters in campgrounds and boiled that down into what has worked and what has not. The options available to the Forest Service vary widely. Campgrounds could be restricted to hard-sided trailers and campers only. The amount of hiding cover could be reduced. Campgrounds could be moved away from streams and rivers, which are migratory corridors for bears and other wildlife. Patrols at campgrounds could be stepped up by campground hosts. More information could be handed out or signs posted to educate the public. Campgrounds could even be organized like the old wagon trains, with hard-sided campers on the outside edges of the campground sheltering the tent campers in the middle. “These have all been tried with different levels of success in different areas,” Tyres said. The data confirm what the agency already knew anecdotally. The question arises, though, how safe the Forest Service should make the great outdoors. Taken to the extreme, should campgrounds be fenced to keep bears out? Should the fences be electrified? That’s not likely to happen. No matter what’s decided by the forest supervisors, Tyres sees his collection of information as invaluable to the forest workers on the ground, giving them a better idea of what each of the area’s 166 campgrounds contains. “This is more about putting the tools in their hands,” he said.